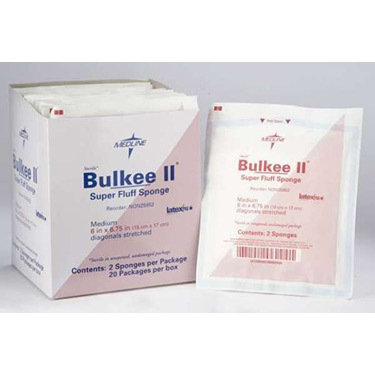 Superior loft, bulk and absorbency make the Bulkee sponge an excellent primary dressing. It effectively manages exudate in and around the wound because of its strength and absorbency: this sponge is ideal for pre-op prepping and cleansing, debriding and packing. Sterile, 6" x 6.75", 2 pack.